Like all other artworks, garden sculptures also raises conflicting emotions. It is a matter of personal taste. A modern garden sculpture can be of the form of a dancing girl or a Buddha statue. One can even place the sculptures at the tops and the bottoms of the set of steps. But, in this case, the sculptures must be a bit smaller in size. With these, it is possible to grab the eyes of the guests at your interior decors too. Some of the garden sculptures can prove to complement the plants in the area as well. These types of sculptures must be placed beside the plants. Groups of sculptures can also be set in a meadow outside the veranda or the tea room of the house. This type of gardens can give the neighbors something to discuss and talk about. And if the garden is a sloping one where nothing much grows, a sculpture can be the right answer. Pots or vases of different shapes and sizes can be considered as another popular form of sculpture. Empty pots, made beautifully can enhance the outlook of the space. Modern planting requires the structure of sculpture. The loose, informal planting looks outstanding with sculptures. 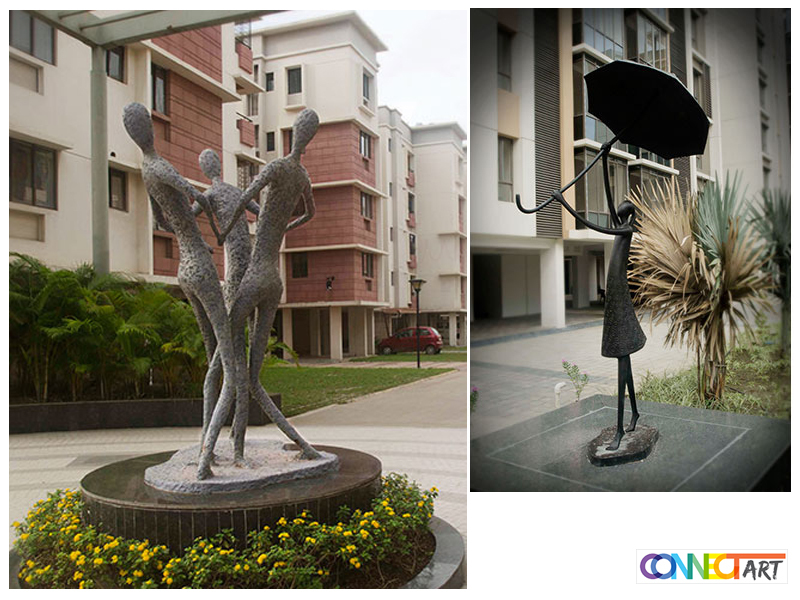 The contrast of the airy blocks of grasses and clean lines of the modern sculpture are sure to be loved. Modern garden sculptures in animal forms – From the wire hens and hares to the witty pigs and cows, even the smallest sized gardens can accommodate these sculptures. If one has one of those types of kitchens that have glass doors and walls then he or she can see the garden all year round. One can add color to the sculpture also to make it stand out among the other decorative objects. Water and some garden sculpture forms go well together. One can have a sculpture somewhere close to the garden pond. This ameliorates the water’s flatness. Some of the garden sculptures have been repurposed from something different. A sculpture like a twisted iron may look quite innovative and contemporary. There are several other garden sculpture ideas. To see more of these outstanding garden ornaments, check out the catalogue of the top sculpture manufacturer. The most inventive and unique Garden Sculpture Art in Kolkata can be found here. These are the lovely inspirations for the garden areas.